Pair of hand-carved wooden clogs with pointed toes. Mostly unpainted, except for gold on inside and sole. Worn at Theodore Weichselbaum's brewery in Ogden, Kansas. Weichselbaum's brew house opened in Ogden in 1871 and employed several German brewers until state prohibition forced its closure in 1881. 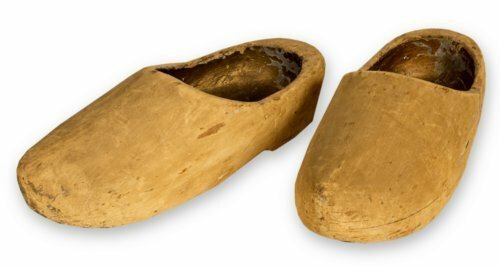 Wooden clogs were worn on the brewery floor and cleaned daily after wearing.